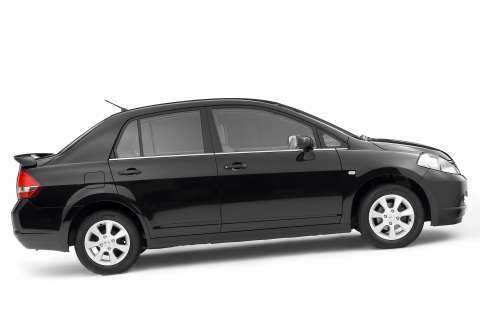 Nissan’s Pulsar replacement, the all-new Tiida compact sedan and hatch, arrives in Australia on 1st February, 2006. Tiida offers a leap forward for Nissan customers with its modern design, premium finishes and spacious interior. The name Tiida was coined from the word “tide,” and refers to the ebb and flow of the ocean. Australia is the first major market outside Japan to receive the Tiida, ahead of larger markets such as the USA, the United Kingdom and Europe. And while Tiida has a global footprint, the design, specifications and equipment offerings are customised for each major market. The new Tiida is built on Nissan’s “B” platform, with priorities placed on interior roominess, a high quality interior and comfortable, stress-free environment. In developing the Tiida packaging, the design and engineering teams found a way to put a big interior in a small car. The exterior of the Tiida hatch and sedan feature a dynamic look with attention to detail, as seen in the large headlights, signature Nissan grille and large taillights. The crisp, youthful body forms and long rooflines suggest both the roominess inside and Tiida’s performance capabilities. The new Tiida offers occupant comfort and roominess normally associated with larger cars. It is one of the most spacious cars in its class thanks to the consideration given to the interior and exterior dimensions which maximise the available head, leg and shoulder room. Both the Tiida hatch and sedan also feature large cargo areas. Along with a spacious cabin, Tiida offers high quality interior design and craftsmanship. The interior features a clean, simple design and layout that accentuates the available space. The wide, laterally oriented instrument panel underscores Tiida’s width, while the low centre console flows freely toward the rear, giving a sense of the interior’s length. To give the interior a sense of luxury, soft-feel materials are used on the instrument panel padding, door trim fabric and headliner. Polished metallic finishes enhance the ambience of the cabin. Powered by an all-new all aluminium DOHC 16-valve 1.8-litre engine developed in conjunction with Nissan’s alliance partner, Renault, the Tiida boasts excellent fuel economy and performance. Adoption of continuous valve timing control (C-VTC) has resulted in better efficiency without sacrificing power. Tiida generates 93kW of power at 5,200 rpm and 174 Nm of torque at 4,800 rpm. Two transmissions are available with manual models the first in its class to get a six-speed transmission across the range. A four-speed automatic transmission with lock-up torque converter is also available. Tiida features a strut suspension system at the front and an H-shaped torsion beam suspension at the rear and incorporates internal rebound springs and ripple-control shock absorbers, providing optimum handling and stability combined with supple ride comfort. Both hatch and sedan feature dynamic body forms that achieve superior aerodynamics. With 0.29 drag coefficient and zero body lift at the front, the Tiida hatch ranks among the best in its class in terms of aerodynamics to deliver comfortable and economical driving. Tiida will be available in a range of specification levels – the hatch in ST, ST-L and Q, and the sedan in ST, ST-L and Ti. All ST models receive a host of standard features, including driver and passenger SRS airbags, front seatbelt pretentioners, air-conditioning, keyless entry with central locking, CD player with four speakers, power mirrors, variable front intermittent windscreen wipers and 15 inch steel wheels with full covers. Tiida ST hatch also receives a 60/40 split rear seat. A Style Pack is optional for all ST models and adds 15 inch alloy wheels, power windows and Tricot seat trim to the entry-level model. The ST-L Tiida hatch and sedan receive additional features including SRS curtain airbags, ABS braking system with BA and EBD, power windows, - 15 inch alloy wheels and Tricot seat trim. 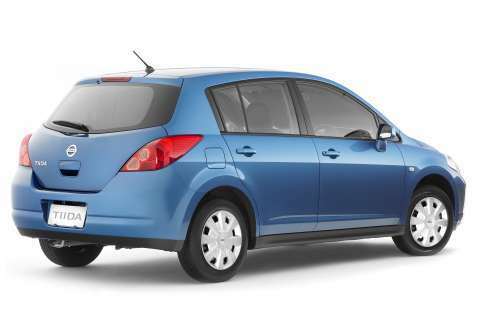 Tiida’s top of the range variants – the Q Hatch and Ti sedan – add leather steering wheel and luxurious leather/cloth blend seat trim, polished metallic interior trim, front and rear armrests, overhead console, six speakers, front map lamps and passenger vanity mirror. The Q Hatch also receives front fog lights, a rear spoiler and rear sliding seat, whilst the Ti sedan gains a 60/40 split fold rear seat with boot access. Both hatch and sedan variants are available in a range of colours including Slate Grey, Sapphire Black, Platinum, Polar White, Sparkling Beige. Harvest Yellow and Crystal Blue are exclusive to hatch variants and Mars Red is exclusive to the sedan. Pricing on the vehicles continues Nissan’s tradition of offering attractive vehicles for the lowest possible cost, with the entry-level ST sedan and hatch available for just $19,990 and the optional style pack an extra $1,000*. The ST-L sedan and hatch are priced from $22,240 and the Q Hatch starts at $24,490. Automatic transmissions are a $2,000 option on the ST, ST-L and Q variants. The Ti Sedan, available with automatic transmission only, is priced at $26,490. The new Tiida hatch and sedan will replace Nissan’s popular Pulsar range which has been incredibly successful for the company. Since the Pulsar was first introduced in Australia in 1980, over 385,000 vehicles have been sold and the vehicle has gained an enviable reputation for reliability, comfort and high specifications at an attractive price. Nissan Australia’s managing director and chief executive officer, Shinya Hannya, welcomed the new vehicle to the company’s Australian line-up. “The small car segment is currently experiencing strong growth, so the time is right to launch our all-new Tiida in Australia. Nissan has always been a strong player in this segment, and the modern and stylish Tiida is sure to appeal to today’s market.” Mr Hannya said. Michael Hayes, Nissan’s manager of product marketing, summed up Tiida’s appeal. “Tiida is affordable, spacious, comfortable, stylish and combines lively performance with excellent fuel efficiency and we know the vehicles will find wide acceptance in the Australian marketplace,” Mr Hayes said. *Recommended retail pricing only - does not include on-road or dealer delivery charges. Volkswagen GX3 Concept - Car Or Bike?